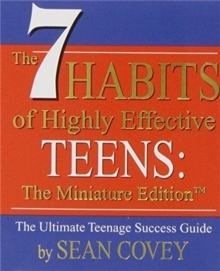 Based on his father's bestselling The 7 Habits of Highly Effective People , Sean Covey applies the same principles to teens, using a vivacious, entertaining style. To keep it fun, Covey writes, he "stuffed it full of cartoons, clever ideas, great quotes, and incredible stories about real teens from all over the world... along with a few other surprises." Did he ever! Flip open to any page and become instantly absorbed in real-life stories of teens who have overcome obstacles to succeed, and step-by-step guides to shifting paradigms, building equity in "relationship bank accounts," creating action plans, and much more. As a self-acknowledged guinea pig for many of his dad's theories, Sean Covey is a living example of someone who has taken each of the seven habits to heart: be proactive begin with the end in mind put first things first think win-win seek first to understand, then to be understood synergize and sharpen the saw. Covey's humorous and up-front style is just light enough to be acceptable to wary teenagers, and down-and-dirty enough to really make a difference.